Review date: 13 September 2001. Want a general purpose PC reference book that'll also come in handy if you need ballast for a tugboat, or a nice hardcover improvised weapon? Behold. Scott Mueller's Upgrading and Repairing PCs, 13th Edition. From the Editor's Note to the end of the 93 page Index, this book is 1556 pages. There's also a heck of a lot more pages, from previous editions, on the CD that's tucked into an envelope at the back. On a per-pound basis, this is a pretty cheap book; it lists for $US59.99, but Amazon have it for $US41.99 as I write this. Other online booksellers are starting to stock it as well, now. I've owned a couple of previous editions of this book, but I can't honestly say I'm completely qualified to review it. Because I've never read it, and I never will. This book is not meant to be a bedside-table companion, or a thrilling holiday blockbuster. It's a reference work covering the theory and practice involved in doing the job described in its title, and it's about as comprehensive as you'd expect from its elephantine size. 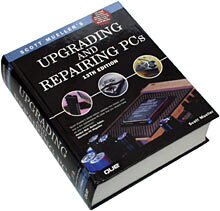 You can read Upgrading and Repairing PCs from cover to cover, if you feel like it. On the way, you'll learn about how silicon ingots are sliced into wafers with a diamond saw, how to decode RAM chip markings, the difference between 40 pin desktop and 50 pin laptop IDE drive connectors, the magnetic medium details for 2.88Mb 3.5 inch floppies, the possible flavours of PhotoCD, the difference between DFP and DVI connectors, the four kinds of parallel port, the common varieties of keyboard keyswitch, DSL distance limits, how to make network cables, power supply form factors, laptop CPU steppings, and file system troubleshooting. And about a zillion other things, including, of course, how to actually plug all of the bits together. Reading it like a novel is not what most people are going to do with a tome like this, though. They're going to do what I do - keep it handy for when they need to know something. And this book makes it pretty easy to find what you're looking for. Apart from the enormous index, there's also the new Appendix C "Troubleshooting Index", which aims to make life easier for scowling readers holding a Thing That Does Not Work in one hand. In 34 pages, this Appendix breaks down common PC problems by category - Audio, Battery, BIOS, CD-ROM and so on - and gives quick problem and solution descriptions, and references to the appropriate page for a proper discussion of the problem. There's also Appendix A, a 62 page Glossary which serves as a pretty good one stop computing dictionary. On the included CD-ROM, there's 506Mb of video split up into 15 crunchy little postage-stamp-image-size MPG files. These files all have Scott Mueller himself sitting behind a desk and taking you through various PC tasks and technologies - assembling a PC and installing the OS, and the basics of different CPUs and motherboards. One of the basic rules that they teach you when you do a radio or TV presenting course is that every time you say "Um" or "Ah", you should visualise a million ton weight falling on your favourite pet. Scott Mueller, like Bill Gates and Steve Jobs, has clearly not taken such a course. Well, hey, all of those guys are pretty rich. The umming and aahing seems to be working for them. Some rich guys are a lot weirder. Look on the bright side. Fortunately, there's plenty of more useful stuff filling the rest of the CD. You get "over 5000 pages" from five previous editions of the book, for a start. The 6th, 8th, 10th, 11th and 12th editions are all on the disc, in Acrobat format, which lets you do full-text searches. These older editions plug various holes in the current edition, which would be substantially fatter if it still included seldom-needed information like, for instance, data on various elderly video chipsets. There are occasional notes in the 13th edition that tell you when there's more info on the CD. The CD also contains a slab of supplementary general reference information, again in Acrobat format. BIOS error codes, modem commands, hard drive specs, keycodes, legacy system drive setup info, that sort of thing. You get the Blue Planet hard drive guide on disc, but you can access the latest version of that for free here, as well. There's a hefty Vendor Database which indexes 396 US computer gear manufacturers and associated businesses, but which doesn't seem to list anybody outside the USA. There's also a half-decent list of Web resources, and a reminder about the existence of UpgradingandRepairingPCs.com. The primary purpose of that site is to persuade you to buy the book, but it's also an OK information resource in its own right. So, if you ever crack the case of your computer, this book and its CD are likely to be useful to you. But that in itself doesn't make the thing worth buying. The big question here is a simple one - why should you bother with this book, when there's tons of computer fixing and building and troubleshooting information available for free on the Web? I use Internet PC information sources all the time. Apart from search engines, I get a lot of use out of the PC Webopaedia and FOLDOC for definitions and jumping-off points. PCGuide isn't the most up-to-date site out there, but it's got a lot of good general reference information; Annoyances.org is handy for Windows problems, and there are of course umpteen different hardware sites for discussions of particular bits of gear. Microsoft's own knowledge base is a good source for various Windows issues, some of them very obscure indeed. If you want to know why your Quijibo 4025 video card doesn't work right in OS/2, search Usenet, because no book, or Web site, is very likely to help. The forums on specialist hardware sites (like these ones on Amdmb.com, for instance) can be helpful for specific queries like these, but there are so very many possible hardware and software combinations that it's often possible that nobody with your exact problem has put information about it anywhere on the Internet. And there are, of course, FAQs for lots of things (see the monster list on MIT's FTP site here, for instance), some more amusing than others. The reason to drop $US42-plus-shipping on Scott Mueller's magnum opus, though, is that it puts a large amount of well-vetted information in one place, and make it easy to find what you're after. This is convenient even when you've got Web access right to hand; it's invaluable if your one and only computer is the one that's in bits all over the dining room table. Of course, Upgrading and Repairing PCs won't magically update itself, while a lot of information on the Web will. This latest edition of Mueller's book is at least, as of now, quite respectably up to date. It's got information about Pentium 4s and Serial ATA, for instance; all but the most recent video chipsets are covered as well. But the delays involved in getting out a dead tree edition of a reference work mean that a book can never quite be on the cutting edge, when everything's changing as fast as things do in the PC world. There's not much information in this book concerning the now-available Socket 478 Pentium 4 form factor, for instance. There's a mention of Socket 478 being used for the upcoming Northwood-core P4s, which is what we all thought it'd be for when the Socket 423 Willamette-core P4s first came out; now, though, you can buy Socket 478 Willamette P4s. And if you're not careful, you might, despite the fact that you own a Socket 423 motherboard that the new smaller chip won't work on. The book also covers Thunderbird-core Athlons, but not Palomino-core ones. And if you want information on the various flavours of Via C3 CPU, you won't find a thing. The omissions, though, are generally minor; as I write this, pretty much whatever you've got in your PC, or see on the shelf at the computer shop, seems likely to be covered in Upgrading and Repairing PCs. Is this book a must have? Well, if you're a reasonably handy person with no clue whatsoever about PCs who, nonetheless, would like to assemble and/or maintain your own computer, then this book will tell you pretty much everything you need to know, and pay for itself several times over. If you've already got your PC-twiddling act together, you don't have to have this book. But it's nonetheless a useful thing. It could save you a lot of time hunting information on the Internet, even if you've got a working Internet connection when you find you need that information. But if you've already got a recent previous edition of this book, then I don't think there's any hugely pressing reason to spend more money on the 13th version, at least if you use the book as I do. A lot of the annoying twiddly stuff that a book like this comes in handy for isn't brand new technology. Given that you can get the new edition for a passable discount already, though, anybody who wants a mighty PC reference work, and doesn't have a young-ish previous edition, could do a lot worse than buy the 13th Edition right now.